Little Dunham is a small parish in the Breckland district of Norfolk. Located in the centre of Norfolk on the high chalk plateau the village name is particularly apt. Coming from Old English it can be translated as ‘homestead or village on the hill’. Little Dunham is 96m above sea level and as such is one of the highest parishes in the county. The village is mentioned in the Domesday Book, but has a joint entry with adjacent Great Dunham. The earliest recorded finds from the village are a number of Neolithic axeheads (NHER 4168, 4169, 4170, 4171 and 4172). A Bronze Age palstave (NHER 4174) and a socketed axehead (NHER 13837) with rib and pellet decoration on each face are also recorded. At one site a piece of Bronze Age pot and a Bronze Age awl (NHER 30277) were also found. Fragments of Iron Age pot have been found at several sites (NHER 4198, 30236, 30272, 30274, 30277 and 31112). In one location over sixty pieces have been recorded (NHER 31112). Interesting Iron Age finds include a coin (NHER 30273) and an imported Etruscan or Villanovan bridle-bit ring (NHER 4175) depicting a horse. A possible prehistoric burnt mound (NHER 35109) has also been found. The North Pickenham to Toftrees Roman road (NHER 3697) passes through the parish. Earthworks of a causeway flanked by ditches (NHER 31197) may be an extension of this road. Fieldwalking has recovered two scatters of Roman finds that indicate the location of settlement (NHER 20519 and 30273/30277). Other finds include coins (NHER 4197, 11351, 30273 and 30403) and pieces of pot (NHER 30236 and 31147). These include one example of East Anglian Colour-Coated ware (NHER 31147). A circular enamelled Roman brooch (NHER 4179) was recorded as being found before 1847. More recently metal detectorists have found a steelyard weight and a strap end (NHER 30272). There is less evidence for Saxon activity in the area. Metal detectorists have recovered some finds. These include Early Saxon brooches (NHER 4197 and 30277) and an Early Saxon buckle (NHER 4198). Fieldwalking located a concentration of Middle Saxon pot (NHER 30236) and an excellent example of stamped decoration on another piece of Middle Saxon pot (NHER 30272). 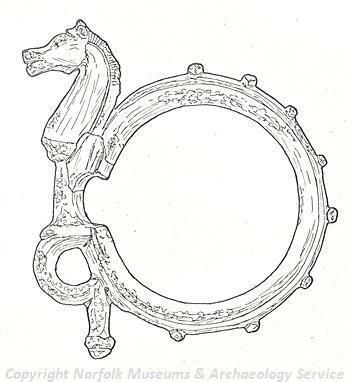 A Middle Saxon brooch (NHER 4197) has also been recovered. Records suggest that there was a Late Saxon cross in the churchyard of St Margaret’s Church (NHER 4207) but this seems unlikely. Pieces of Late Saxon pot (NHER 16093) have also been located. The site of a possible medieval moat (NHER 4180) was partly demolished by a bulldozer in 1963. The earthworks of an enclosure of a possible medieval manor (NHER 11351) can be seen to the west of St Margaret’s Church (NHER 4207). If these are indicative of a manor then the church may have started life as a manorial chapel. The current medieval flint church has an Early English nave, chancel, north aisle and demolished chapel. The tower is in Perpendicular style as is the south porch. Inside is a remarkable corbel of a horned head on the chapel arcade. Some medieval wall paintings remain on two arches in the chancel north arcade. The location of a medieval settlement (NHER 20519) on the borders of the Little Dunham and Fransham parishes has been located. The line of a medieval track (NHER 4205) called Brancaster Road used to lead to Brancaster Common. The earthworks of this hollow way can still be seen by Spoil Bank wood. The site of a medieval cross (NHER 12409) at ‘High Cross’ is less easy to locate. Nobody seems to remember where High Cross was! Medieval finds include an intriguing coin mould used to cast pennies or tokens (NHER 4181). This was found in a garden in 1842. A heraldic pendant (NHER 4198) and part of a medieval pottery chicken-feeder (NHER 17431) have been recorded. A penny of Stephen (NHER 28746) was also found. The Old Rectory (NHER 44328) was built around 1700 but was significantly enlarged in 1731 and 1783. The earthwork of the original drive (NHER 11351) to the house can be seen to the east of the church. Canister Hall (NHER 44327) was built in the 18th century. Dunham Lodge (NHER 4202) claims to be the highest country house, at 96m above sea level, in the county. This Georgian red brick great house was built in the early 1780s. William Cowper stayed here in 1795. The stables (NHER 44326) and Gardener’s Cottage (NHER 44325) were also built at the same time. The obelisk (NHER 4208) can be reached by walking past the Lodge, but was originally erected in 1841 in the ground of Curds Hall (NHER 4203). It was built to celebrate peace at the end of the Napoleonic Wars and has a plaque in memory of Nelson. It was paid for by John and Mary Drostier who lived at Curds Hall. Mary Drostier was Nelson’s aunt. Dairy Farm House (NHER 31931) is at least partly 17th century. The structure includes many reused stones perhaps from St Mary’s Church (NHER 4200) in Great Dunham. The foundations of a number of post medieval cottages arranged around a funnel-shaped green can still be found within a small patch of scrubland to the east of the golf course (NHER 43278). These cottages are also marked on old maps. These may have been built with material from Castle Acre Priory (NHER 4096). The sites of the pound (NHER 13724) and a brick kiln (NHER 15158) have also been recorded. Excavations at The Paddocks prior to residential development recorded medieval ditches and pits (NHER 37318). More recently the Victorians dug several rubbish pits here. The Lynn to Dereham railway line (NHER 13600) passes through the parish. The station house, a goods shed, a waiting room and the railway pub have now all been converted into houses. There is a good example of an underbridge. The most recent archaeological site recorded on the database is a World War Two pillbox (NHER 32416) hidden in a hedge. The bricks have all been stripped from the pillbox. Megan Dennis (NLA), 9 May 2006. Knott, S., 2004. ‘St Margaret Little Dunham’. Available: http://www.norfolkchurches.co.uk/littledunham/littledunham.htm. Accessed 9 May 2006.